Chrissy knows her two jobs couldn’t be more different, but her main goal in life is to help others and live each day like its her last. Getting a breast cancer diagnosis is a lot like hiking a trail to Chrissy Householder. There are twists, obstacles, high points, and low. Householder was diagnosed with breast cancer at the end of April 2018, right after she graduated from nursing school and landed her dream job at the University of Tennessee Medical Center in the Cardio Vascular Intensive Care Unit. Before her diagnosis, Householder didn't want to believe the lump she found in her breast in November of 2017 could be breast cancer. She had a lot on her plate with school, she thought she just wasn't taking good care of herself, and she felt she was too young to have anything like cancer happen to her. As soon as the words came from the doctor's mouth, she knew her life would forever be changed. “When you hear the 'C word,' it’s very frightening," Householder admitted through tears. "But you can get through it. You have to learn every day. It’s a lot of doctor’s appointments and a lot of diagnostic screening to see how invasive your cancer is, but life forever changed in an instant. [I thought] I’m not going to be able to do the things I always did. But I found out that that’s not true." Householder's initial breast cancer journey started pretty quickly. She went through a double mastectomy in early May after finding out she had cancer just a few weeks prior. Four weeks later, she started chemotherapy. She did quite a bit —16 treatments. She then got a month off and went straight into radiation. She went through cancer treatment for about nine months and the magical ending day was January 28, 2019. Ever since she completed treatment, Householder has been able to return to life as normal. 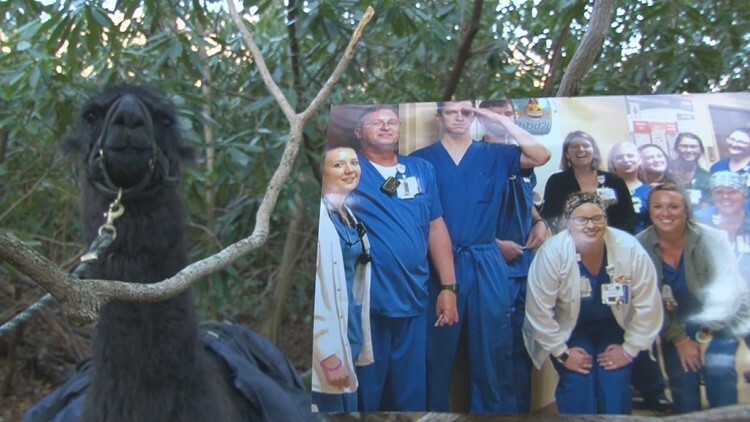 She still works as a nurse at UTMC in the CVICU, and she's also a llama wrangler for Mt. LeConte in the Smokies. This may seem like an unlikely occupational pairing, but to her — she's able to live fully doing what she loves every day and helping people. Chrissy knows her two jobs couldn’t be more different. When she is scheduled to be a nurse, she gets up in the morning, goes into work all showered up and wearing a white coat, she never knows what she’s going to get each day, but loves helping people. 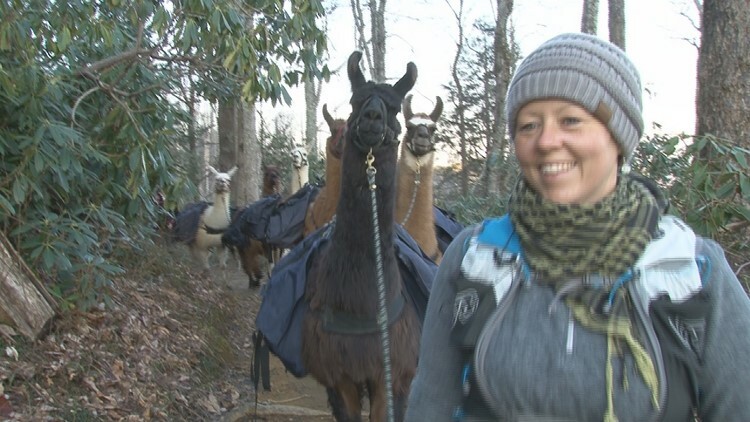 When she wakes up for llamas, she throws on her hiking gear and heads out the door to deal with smelly, but beautiful llamas in the elements. What is a llama wrangler, you may ask? The llama wranglers for LeConte lead trained llamas up to Mt. LeConte and back down a few times a week. They do healthcare, training, and hiking to supply the lodge with food and necessities. It's a tough job-- each wrangling shift is about 15-16 hours, but Householder wouldn't have it any other way. Chrissy and her husband actually live on the farm with the llamas, and she says they are her pride and joy. So you can imagine how hard it was for her when she was going through treatment and couldn't be in contact with the llamas at all due to her weakened immune system. 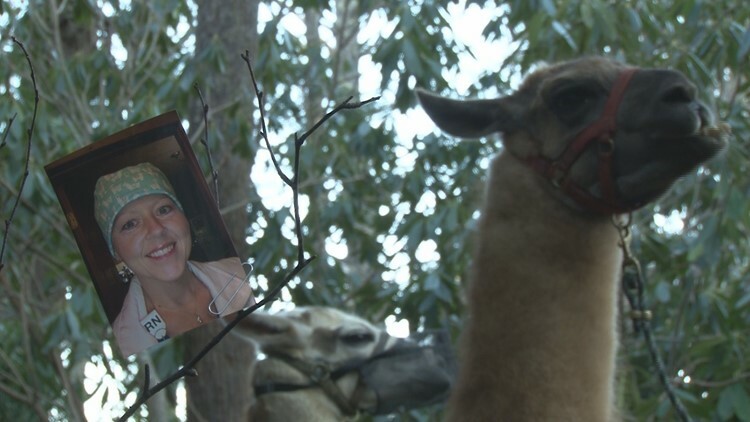 “It was gut-wrenching to watch everyone help take care of the llamas," Householder admitted. "It was awful. The worst thing." But on Wednesday, April 3, Householder got what she so longed for after 9 agonizing months-- interaction and hiking with the llamas she loves so dearly. Chrissy says the llama job is not something she ever thought she would do. She first hiked up to Mt. LeConte in 2009. She says she wasn’t in physical shape, but it was her personal marathon. When she got to the top she had her “aha moment,” and realized she wasn't really living. She came down from the mountain and started getting active and eating better. She told her dad she had decided she was going to work for Mt. LeConte. At first, he thought she was crazy, but she proved him wrong. Householder moved to Tennessee from Ohio and worked at Mt. LeConte as crew for one year, came back a second year, and because she had a zoo keeping background, was asked to become a llama wrangler. She agreed gleefully and hasn't looked bad since. Chrissy said she admires the llamas for how selfless they are and thinks we could all learn a thing or two from them. "We choose the things we do," Householder explained through tears. "They don’t choose to do this. You don’t choose to get cancer. And when we walk them up, they do it because of us. They do it because they’re loyal to us." Chrissy noted how thankful she is to be a part of two incredible teams-- the hospital and LeConte. Both workplaces held her job for her while she went through treatment. She was able to work through parts of her treatment at UTMC, and the people on her team would help her out immensely. Chrissy wanted to give advice to anyone who finds out they have cancer. “We tend to just stay on track with life," Householder explained. "Instead of just taking care of our own health. And it’s important that if you feel like something’s off, if something’s changed, if you feel a lump, don’t wait. Don’t. Wait. Because getting it looked at now gives you more time with your family or your pets or your llamas." Find more Buddy Check 10 content here and don't forget to remind your buddy to do a breast self-exam and do one yourself every tenth of the month.